Time is running out to register for the very first “Fundamentals of Email Marketing” class that I’m teaching in New York City this Wednesday, January 25th. If you’re in the area, and you’re interested in learning more about how to use email marketing as a regular part of your marketing strategy, I’d love to have you. 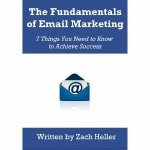 In addition to a prepared presentation, there will be plenty of time to answers your questions and discuss the specific ideas or issues you’ve had as they relate to email marketing. It should be an information-packed 90 minutes. It all goes down this Wednesday at 7:30pm at the SkillShare Headquarters @ 407 Broome Street. Register today! The cost is $20, and I promise that you’ll take away plenty of value for that price.